Learn the High Tibial Osteotomy (Synthes Tomofix plate) surgical technique with step by step instructions on OrthOracle. Our e-learning platform contains high resolution images and a certified CME of the High Tibial Osteotomy (Synthes Tomofix plate) surgical procedure. 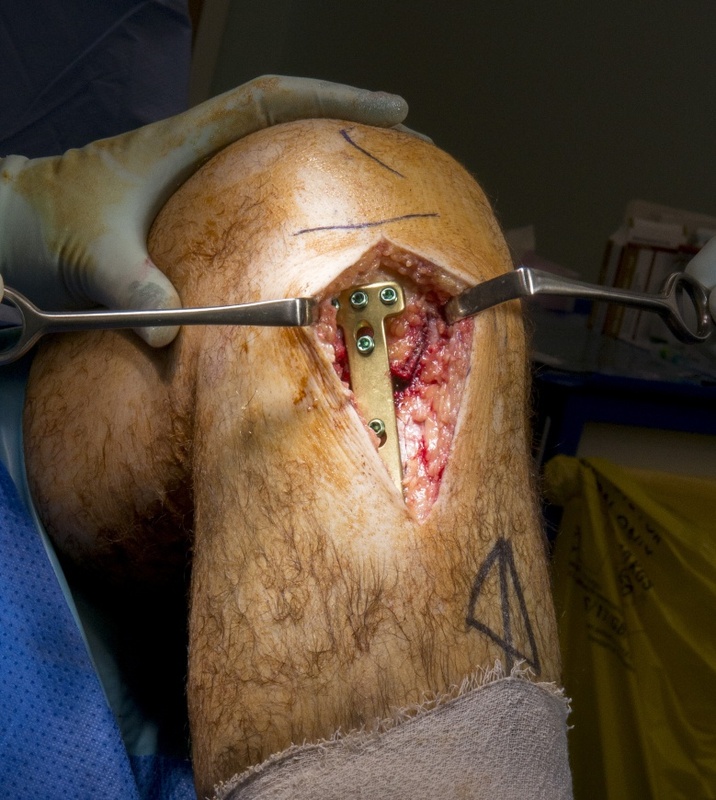 This is a presentation of a medial opening wedge tibial osteotomy for isolated medial compartment osteoarthritis in a 52 year old man who works in heavy labour. In such a case it would be undesirable to consider arthroplasty as a surgical solution to his arthritis. Due to his young age and heavy work he is likely to fail a knee replacement at a young age requiring revision surgery, most likely in his sixties. The result of primary knee replacements are good however patients undergoing revision surgery can expect poor function with low PROMs scores. He may well still be at work at the age he requires an arthroplasty. Being in mind also that the knee has some healthy cartilage in the lateral compartment it would be shame not to “sweat the asset” of the knee and delay arthroplasty surgery for as long as possible. Osteotomy to offload the medial compartment has been shown to be an excellent procedure in these cases. By shifting the weight-bearing axis onto the lateral side of the knee excellent pain relief can be expected and can last for over 10 years. This can be achieved by essentially swinging the ankle laterally by opening a wedge in the medial tibia or closing a wedge in the lateral tibia. This is a description of the opening osteotomy. The presentation describes a biplanar osteotomy, so called as the opening is created in two planes. The opening osteotomy runs across the tibia from medial to lateral at a level proximal to the pes anserinus. The second osteotomy runs up behind the tibial tubercle. The advantage of this technique is that the anterior osteotomy controls sagittal and rotational displacement. Institution: The Worcestershire Acute NHS Trusts ,Uk.